SR87 is a super thin resin which is poured into the brickwork to create a barrier. Once the resin hardens, it effectively creates a line of resin - impregnated bricks, which prevents further absorption of water. This line should be created as low as possible. Water can rise up to about 1,3 m high simply due to capillary action. Garden walls are normally not built with a plastic damp course. This results in damp creeping up the wall, and as it evaporates throught the plaster, it leaves behind white salts, which corrote the concrete. Walls can be damaged in as short a time as 2 years. One alternative, which is very expensive, is to remove all the plaster and re-apply up to a height of 1,3 m adding a water - proofing additive to it. The smart way is to pour SR87 into every brick of the bottom row. The brick line must be above the paving line. This is an inexpensive way to solve your water problems, in garden walls as well as any building wall. Simply drill 2 x 8 mm holes per brick, and pour a small amount of SR87 into the holes. Pour 10 times in each hole. Each hole takes about 6 g of resin / hardener mix. If we do it at least 10 times, each hole will take 60g 9 holes /cm. Usage 540/LM. This is the most cost effectice method to re-create a barrier at the bottom of the wall, interior or exterior. By using a 260 mm long drill bit, the brick is drilled at 45 degree angle from to to bottom. For a double wall brick wall, either use a longer drill bit, or drill from the other side. it works best with cement bricks and old walls. After the wall is sealed, the holes must be pluged with cement & building sand mix. 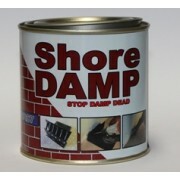 Shore Damp Resin SR87 Shore Damp Resin is used for waterproofing brick or concrete for rising damp control. Manufactured in Johannnesburg. Resin SR87 is a very thin liquid with water – repellent properties. When a brick or concrete wall is properly saturated with this compound, it will becom..